We’re well into July but the summer fun is far from over in Big Canoe! Skip the indoor Netflix binge and gather outside with loved ones instead to watch your favorite family-friendly blockbusters. 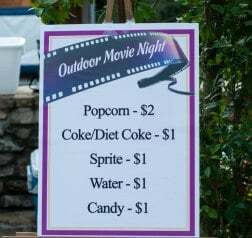 Originally held on the lawn at Playfield Park, the Outdoor Summer Movie Series has been moved to the Wildcat Recreation Pavilion because of the unseasonably rainy afternoon weather this year. Moviegoers are encouraged to bring their own tailgating or camp chairs, snacks, blankets, and drinks. Snacks will also be available for purchase at the venue. This fun event is free to all Big Canoe property owners and their guests. Movies begin at dusk (around 9:00PM) and last between 90 minutes and two hours. The June and July movies have all been kid-friendly hits and included popular films like Sing, Trolls, The Spiderwick Chronicles, Rogue One: A Star Wars Story, Moana, A Dog’s Purpose, and Madagascar 3. On Wednesday, July 26, the final family feature is The Lego Batman Movie. The following week, Wednesday, August 2, is date night and features Hidden Figures, a biographical drama based on a book about African-American female mathematicians who worked at NASA during the Space Race of the 1960s. Hidden Figures is rated PG and stars Octavia Spencer and Kevin Costner. For more information, contact Kim Cooper at kcooper@bigcanoepoa.org or 706-268- 3346. We look forward to seeing you there!